Finally technology has caught up and we can now use the same tool for all over body grooming. Once I saw the Mangroomer on Amazon.com, I knew eventually somebody would make an all in one that covers the back hair as well as everywhere else! And of course it figures it was Philips Norelco. Since they dominate the men’s grooming space, it was only a matter of time. 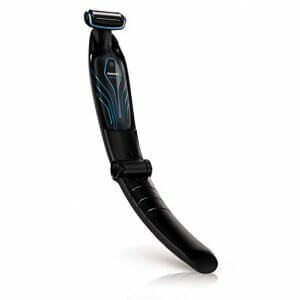 The Philips Norelco Bodygroom 3100 can shave you from the neck down. It can handle your chest, back, legs arms and you can guess where else it works. And since it is from Norelco, you know it’s going to work. Let’s dive into the review and take a look at how awesome this body groomer is! To groom your whole body you need to have a few attachments. This way you transform the trimmer to suit each job you’re asking it to do. 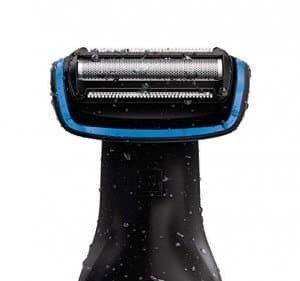 The way the shaver is set up is interesting. It is your typical foil razor that you would use on your face, but on the top and bottom it has a set of teeth. 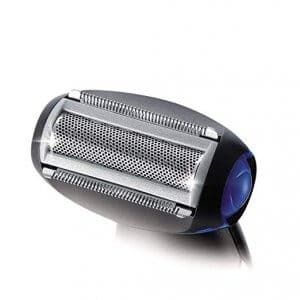 This acts as a trimmer, so you can trim your hair and then shave the skin at the same time. If you have seen the Norelco OneBlade Face and Body, then you are already familiar with the concept. As the trimmer section passes over the hair, it knocks it down to a manageable level for the razor head. An electric razor needs to have the hair trimmed down to stubble or it won’t be able to shave. Rather than have to use a trimmer to do this and then a separate razor, it is a nice all in one solution. You may notice the foil is much more open than what you would normally see with a model that works on your face. Since your face can be sensitive, the holes are smaller to prevent contact with the blades. The hair on your body is also not quite as dense so it is more open to collect the hair to then shave them. Since your chest isn’t as sensitive as your face it doesn’t irritate. There is one obvious area of the body which can be quite sensitive! I’ll go over that area in more detail in a moment. Under the foil is a very sharp set of blades that oscillate back and forth. There are plastic comb attachments that go over the blade to control the length if you wish to leave the hair longer and not shave down to the skin. What really makes this cool is that it has a detachable arm. So when you’re using it on your chest or arms or legs, for example, it is the same size as you would expect from a body groomer trimmer. Then you can attach an extension so you can shave your back yourself. Right down to the skin due to the foil razor shaving head. Overall, pretty good. But, as you might expect from a tool that tries to do everything, some areas leave something to be desired. Let’s go over each area that it can used on and evaluate it separately. As I mentioned already, you don’t have to trim your hair before shaving it. So, it’s nice to be able to run the Philips Norelco Bodygroom 3100 right over your chest and let the pre trimmers do the work. You can get a nice smooth chest just as you would if you used a regular foil electric razor. And in less time. You do have to go over the same spot a couple of times to make sure you get an even cut, but at least it doesn’t leave stray hairs uncut. The razor does especially well on these areas. Since the hair on your legs and arms are finer than your chest hair generally, it can get a smoother shave and without needing to keep going over the same spot. The narrow size of the head comes in handy at this point. The weird contours of your armpits make it tough to get a smooth shave, but since the Philips Norelco Bodygroom 3100 can navigate those areas well, it cuts it right down. It’s pretty gentle on the sensitive skin under the arms as well. I have to say, this is not amazing on the back. Ergonomically, it just doesn’t get it right. This is one of those symptoms of trying to do too many things so one area suffers. If you have hair mainly on the shoulder blade area of the upper back, then you should be fine. If your hair is not too thick on your back, you should also be fine. If, instead, your back is very full of hair all over, then I would get a dedicated back hair shaver. It doesn’t do a terrible job, it just doesn’t get the exact angle due to the way the long handle extension attaches to the body of the razor. It’s adequate but not exceptional. This is the question everybody wants to know. How does it work on the balls? You really have to take your time and make sure that all the skin is pulled really tight. Any loose skin may end up getting nicked. If you have really thick pubic hairs, then you may find it pulls a bit. After trial and error, then you should be able to figure out the best angle to use it and avoid any discomfort. Like with the back, it does an adequate job, but it doesn’t work quite as well as a dedicated pubic hair trimmer. One of the features I like best about this body groomer is the LED display for the battery. It is green when it is full and then turns blinking orange when it needs to charge. But, unlike other shavers, you know exactly how much time you have left when the light comes on. You have 10 minutes of further use when you see the orange blinking light. Once it is fully charged, you end up with 50 minutes of use before it needs to charge again. There are two negatives with the battery aspect, however. One is that it takes 8 hours to fully charge. That is quite a bit longer than you would expect with today’s better batteries. The other is that it is a Ni-MH. These batteries end up giving out and not taking a charge much sooner than the Lithium Ion counterparts. You might get a few years before this happens, or it might take less than two. That is part and parcel of Ni-MH batteries, however. The best part about this is that it can be used in the shower. I will recommend that you already have trimmed yourself while dry before you do it in the shower. The reason for this is that long hair is hard to shave when it is wet. If you are at the stubble stage then you will have a much easier time of it. And shaving in the shower is much more gentle on your skin. When your skin is wet it acts a lubricant so the shaver glides which protects the skin from irritation. If you do use it dry, then you can rinse it off under the faucet to keep it clean. I highly recommend that you don’t leave it stored with hair on it and you do rinse it off. Hair is acidic and will eventually dull the blades. Most of the time when I read reviews of people complaining about a trimmer going dull too fast, I guarantee that person wasn’t keeping it clean. Just make sure you air dry it after you use it and keep it out of any damp areas. To really get the most out of the Philips Norelco Bodygroom 3100, here are a few ways to get the shave you expect from a Norelco body grooming tool. The first time you use it, your hair is going to be fairly long. You’ll need to take it slow to make sure that the longer hairs are all cut as the razor head goes over it to shave to the skin. If you go slow, then the long hairs will cut evenly and you won’t be leaving any long stragglers. Your body hair grows in many different directions. The best way to go is to come at it from different angles. Luckily there are the trimmer blades on the top and bottom of the shaving head so you don’t have to contort yourself to change the angle. Just go with the hair and then against it. If there are still stragglers, then come at it from the side. When you’re trying to get things as close as possible, then it is tempting to push down harder against the skin. This will actually do the opposite as you aren’t leaving room for the hair to be lifted into the the blades. You’re also likely to feel some skin irritation afterwards, as well. And finally, you can damage the foil that covers the blade and wipe out your shaver as a result. I already mentioned this before, but it bears repeating. You’ll get much more time out of your Philips Norelco Bodygroom 3100 if you are keeping it hair free and clean between uses. Since the hair can dull the blades, the cleaner it is the longer you will get a good, close shave out of it. If it does end up going dull on you, then you can purchase a replacement head from Amazon.com without needing to replace the whole unit. This is especially handy as a tip if you use the shaver dry. After using the shaver, you should be adding some moisture to your skin. Since you end up taking the top layers of skin off, you should make sure your skin is protected. Apply some skin cream like this one from Amazon.com and your skin will feel incredible as well as smooth. Is it as good as the Norelco Bodygroom Series 7100? They are two different tools so they only compare in a couple of ways. For starters, the 7100 doesn’t do your back. Well, it can shave your back, but you’ll need somebody to help you. What I mean is that it doesn’t have the same attachment as the 3100 that allows you to do it yourself. They both use the same shaving head so the quality and closeness of the shave is identical. It all comes down to what you need them to do. The 7100 has more bells and whistles, but is also almost twice as expensive. The Philips Norelco Bodygroom 3100 is a great body groomer when you are on a budget. It has a cheap price, but don’t let that fool you into thinking this is not well made. It isn’t perfect by any means, and if you have some serious body hair to tackle, it might not be for you. However, for most people this will get the job done and do it well. The sheer amount of jobs it can do clearly makes it a winner in my book. Do you have any questions about this or other body groomers? Ask away by adding a comment in the box below! I love the feedback and will get back to you ASAP!